Ref No Grave or Memorial / Rhif cyfeirnod bedd: I. G. 26. Samuel Jones was born in Rhuddlan in 1882. His parents, John and Margaret Jones, were from Newmarket and their marriage produced nine children. By 1911, according to the census, three of them were already dead. The family lived in the Old Cross Keys on the High Street. John worked as a labourer and as his children became adults they took up various lines of work; eldest son John worked for the Council, Edith a dressmaker, Sam a collier, Robert a baker, Iorwerth a gardener and Muriel a nurse. By 1911 John was 69 years old and unable to work. Only John junior was married, the rest of the children remained single. I suspect that Samuel was working as a collier in Yorkshire as it was in Barnsley / Pontefract that he enlisted. This could explain why he joined the York and Lancaster Regiment. Many of his service records are available online. His attestation papers state he had previously served in the Royal Welsh Fusiliers. He was 5ft 6inches with light brown hair, blue eyes and tattoos on each forearm. Thus, on the 21st of August 1914 he was passed fit to serve. Sam was posted to France on the 18th of March 1915. In August of that year he was wounded. His evacuation from the battlefield was via a field ambulance to Number 10 Casualty Clearing Station from where he was sent to the 2nd Canadian Stationary Hospital in La Touquet. He was admitted on the 17th of August with a shrapnel wound to the chest. 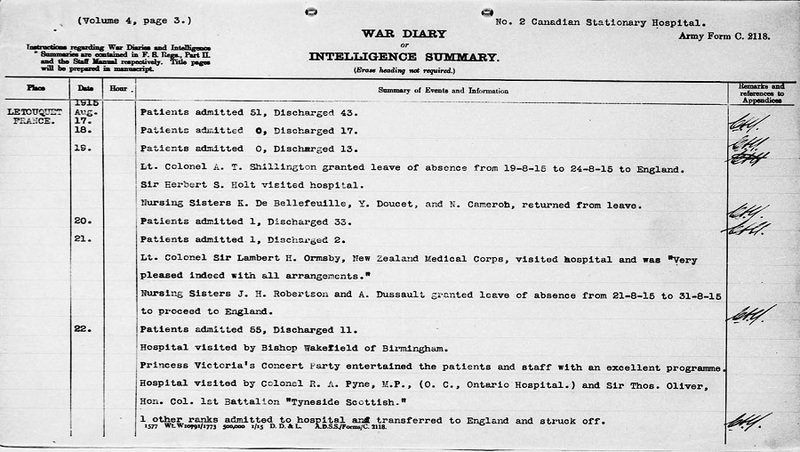 After a few days he was repatriated to the UK via Dieppe. However, by the 16th of December he was back in action, this time in Belgium. It was there a few weeks later, at the end of January 1916, that he lost his life. 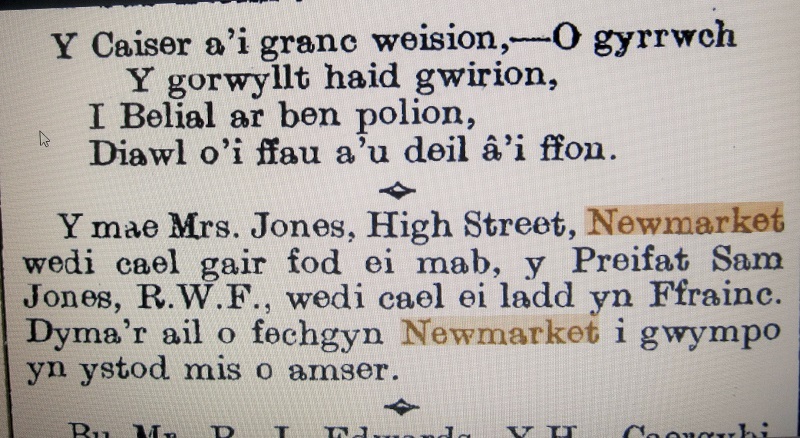 Notice in Y BRYTHON February 1916 to say that Margaret had had word that her son had been killed in France and that this was the second Newmarket boy to have fallen within the month. 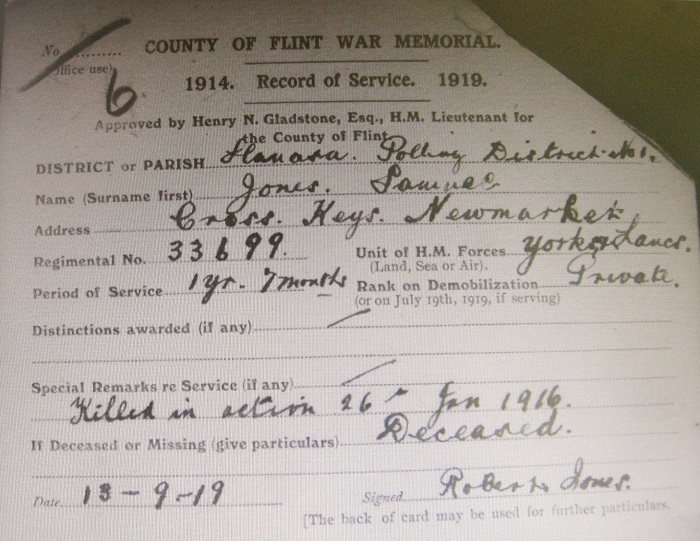 I believe that Sam’s father must have died around this time as the Register of Soldier’s Effects names him as the authorised person to receive any monies due to the family. However this entry is crossed out with ‘died’ along side it and replaced by Margaret, named as the sole legatee. As if that wasn’t enough, at least two of her other sons were also in the Army. Both Robert and Iorwerth served with the Army Service Corps. Robert’s service papers are online too. He was 31 when he joined up and was working as a baker in Greenfield. He joined from the Army Reserve in December 1915 and served as a ‘baker and batman’. In December 1919, after 2 years and 364 days, he was discharged as being ‘surplus to military requirements’. It seems he was not fit to serve abroad as he had a loose cartilage in the right knee the injury having been acquired when playing football 10 years earlier. Surgery in the Southern Hospital in Liverpool had not resolved the problem. He also had ‘flat feet’ since infancy. Robert filled in the Record of Service index cards for himself and on behalf of his brothers. In 1919 when this took place Iorwerth was still serving his country.